If your andouille is raw, smoke the sausage at 225ºF until the internal temperature reaches 160ºF. Use an instant read thermometer like the Maverick PT-100 to check the internal temperature. Then, remove the sausage, place it in the refrigerator and allow to cool. Dice the sausage when it has cooled. If you’re using a pre-cooked andouille, simple dice the sausage. Preheat your Yoder Smoker YS640 to 400ºF, set up for direct grilling (heat diffuser removed). Place a Lodge Logic 12” Cast Iron Skillet or 7 Quart Dutch Oven in the cooker to preheat. When the pan is hot add the oil. 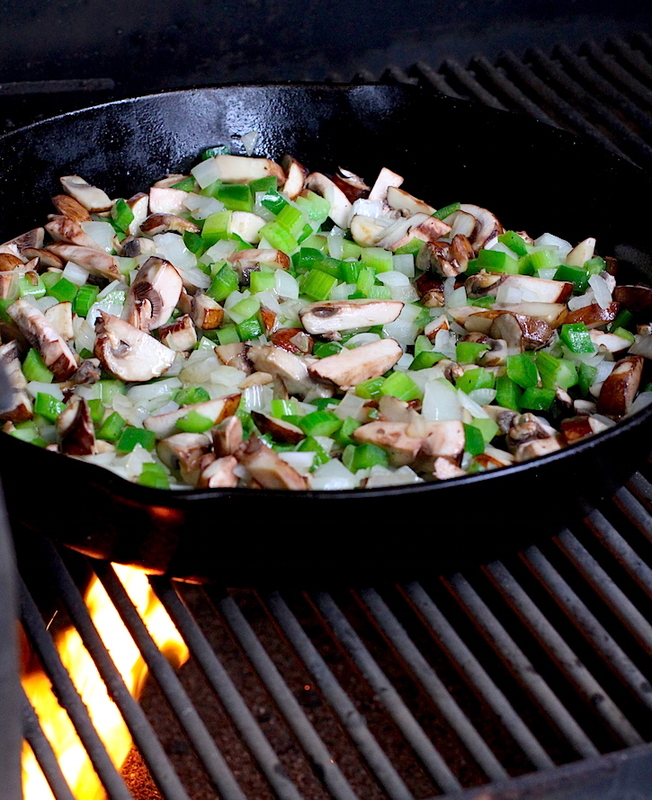 Let the oil warm for 30 seconds then add the mushrooms, onion, green bell peppers and celery. Sweat veggies until softened, and onions are translucent, about 10 minutes. Add the diced andouille, garlic and Code 3 Spices Sea Dog Rub. Cook 1-2 minutes then add the beer and cream. Cook until liquid is reduced by half, about 20 minutes. Add the shrimp and green onions and cook until the shrimp are opaque, about 5 minutes. Serve warm in bowls with sliced toasted baguette. As we fall into Autumn we’re looking ahead for dishes to warm our bellies, and this one is worthy of making that list. There’s no reason to give up the seafood when the warm weather fades. Of course, we know that, because smoked seafood chowders hold a special place in our hearts (and stomachs). 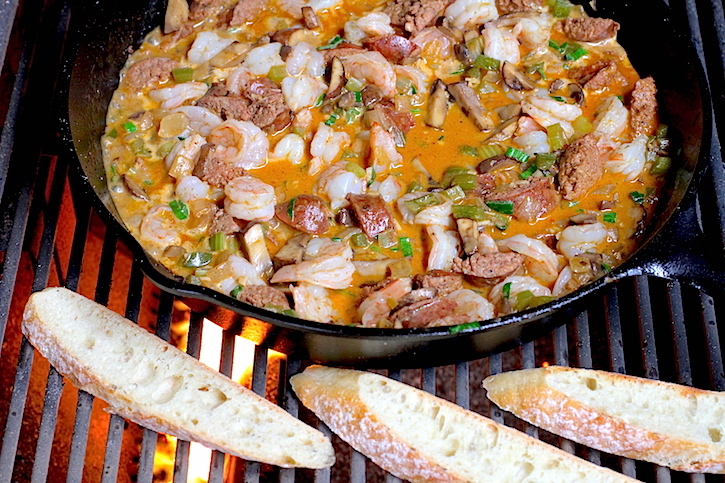 The Cajun flavors in this recipe make this dish a great way to expand your cool weather seafood cooking. We’re using the holy trinity of Cajun cooking (onions, green bell peppers, celery and garlic) as a flavor base for this dish, but if you’re looking to up the heat feel free to add some of those roasted chiles that we made a couple of weeks ago.